It even has little matching socks... hehehe. Hehehee...That's cute. 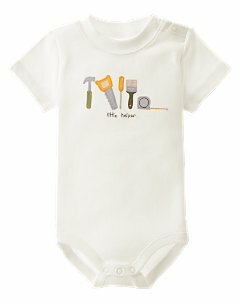 I saw a miniature carhart outfit that I was thinking of getting for my six year old nephew. But when I saw how much it was, I figured I'd get him a PS2 game instead. oh my gosh. that's so cute! where did you find that? Awww, that is cute. I say make it yourself with iron-ons for next to nothing!